Last year Volkswagen had quite the viral hit with "The Force" Super Bowl ad. Of course, many forget that hit required some media spend to drive awareness about the commercial before the big game. 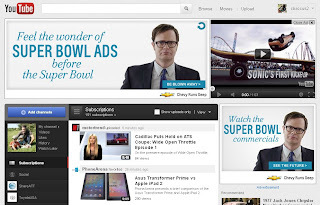 Volkswagen did several paid media placements including the homepage of YouTube. The awareness raised by advertising assisted sharing dramatically, but mostly sharing worked because "The Force" ad was brilliant with its adorable use of Star Wars encapsulated in the eyes of a little boy playing Darth Vader. This year everyone is replicating VW's strategy to viral success. Ads are showing up everywhere promoting Super Bowl commercials. Facebook ads. Promoted Tweets. 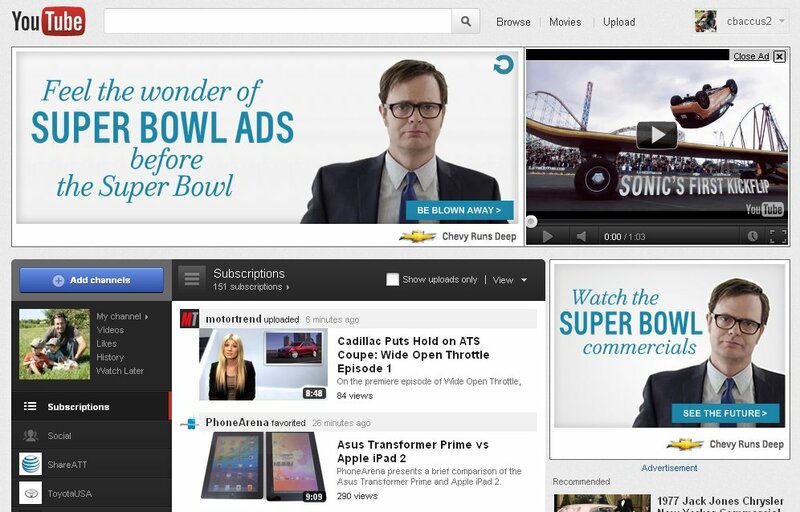 YouTube homepage takeovers. Emails promoting the ads. Here is a list of the Super Bowl commercials having some pregame advertising to drive YouTube video views along with how many views they received as of Saturday morning February 4. Each ad had it's own amount of advertising dollars supporting it. We'll all see a year from now if one of these ads can attain the viral dominance of VW's "The Force" which has 50,014,879 views after a year on YouTube. VW "The Dog Strikes Back"
For a full review of the automotive Super Bowl ads, stay tuned as Melanie at the BeCarChic blog and I will be doing our 3rd Annual She Said, He Said Super Bowl Automotive Ad Review.